There are many strange things about director Leo Hurwitz’s Strange Victory, perhaps the strangest, given the film’s politics, is the time and place in which it was made: 1948/USA. Stranger still is that Strange Victory survived the 1950s Extinction Event of the American Left. Now, 70 years later, it is being reissued on DVD and Blu-ray by Milestone Films. Perhaps with the resurgence of a new American Left, Strange Victory will finally find a home. Strange Victory is a darker version of the postwar story, a darker version that can be seen in disparate things like cynical Film Noir and the incipient Beat Generation. The word “Beat” comes not from some hipster music reference but from “beat” as in “beaten down.” “We survived the Depression, licked the Fascists and man, are we beat.” Maybe Strange Victory is the noir version of Best Years of Our Lives? In 1948, the direction the US would take after the War was up for grabs. On one hand, the Cold War is about to begin (Winter is coming! ), the labor movement is threatened by a resurgent crypto-fascist right and Jim Crow is still openly fixed in place in the South and sub rosa everywhere else in the country. On the other hand, 1948 is the year that Truman defeated the sure-bet Dewey and integrated the US military (a minor and ironic victory), and the gains by the Left during the Roosevelt years seemed secure. Perhaps the uncertainty of which path the country would take was the real source of general unease suggested by Hurwitz in Strange Victory. Strange Victory would have been positively radioactive had you tried to show it in the 1950s, and the FBI would surely have come knocking on your door had you done so. It would not be until after Joe McCarthy and the civil rights movement that Strange Victory could theoretically be shown in polite company, and even then with some caveats. But with the passage of time, it is now safely embedded in the past and possibly Ken Burns might make a documentary about it. That of course has not happened. Instead Strange Victory got swept under the rug as an embarrassment to the national narrative. Strange Victory is not a real drama but more of a documentary and old-school agitprop. And the same could almost be said of Best Years, but chances are infinitesimally slim that Strange Victory was ever shown in a theater that screened Best Years. Perhaps if Strange Victory had had the same general distribution as Best Years, the civil rights movement of the ’50s and early ’60s would not have come as such a bolt out of the blue to mainstream white America. Within Strange Victory there is also a backstory that could make a movie all of its own. Virgil Richardson was an African American actor in the 1930s who, during the War, became one of the Tuskegee Airmen. 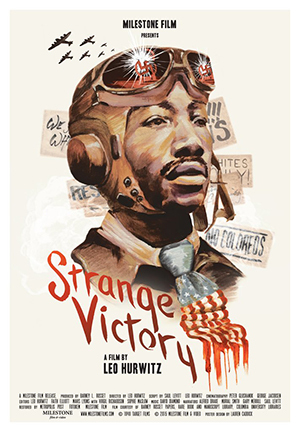 In Strange Victory he portrays essentially himself as a returning African American WWII vet who can not get a job as an airline pilot because of his race. Richardson eventually gave up on the U.S. and emigrated to Mexico. Now that is a movie I want to see made. Strange Victory also presents itself in a strange lo-fi student-film way that puzzled me. OK, it’s a low budget production that’s running against a strong conservative tide, but at the same time Strange Victory has a competence that was hard for me to figure out. It’s coming from some kind of tradition, but what? ...And then I watched the extras on the DVD and... wow! I learned that in the 1930s, director Hurwitz had made several short agitprop films as a member of the Worker’s Film and Photo League. These shorts were of the Depression-era Bonus Marches on Washington DC. He also made a small art film (Pie In the Sky) that features Elia Kazan... again, wow! The Bonus March films look like a 1930 newsreel shot by Sergei Eisenstein. Hurwitz knew his film history and surely he had a fire in his belly when he made them. Pie In the Sky wants to be an angry Charlie Chaplin silent film made by equally angry young men aiming to set fire to the capitalist world. How can you not like that? Maybe the malaise that Hurwitz worries about in Strange Victory has its roots in his firebrand 1930s work. By 1948 Hurwitz had not given up the good fight, but he was as beat as everybody else. The years 1945-1950 often get passed over in the History Channel glosses but it was one of those times when everything changed. Strange Victory, the odd little lefty film from 1948, is a wonderful example of a path not taken, questions asked about race that have yet to be answered, and what the U.S. might become after the War. For extra credit and after watching Hurwitz’s Strange Victory and his Depression-era films, I recommend reading Going Away by Clancy Sigal. Sigal was a teenage Communist labor organizer in the 1930s, a GI in the 1940s, and (amazingly) a Hollywood agent to the stars in the blacklisted 1950s. In 1956 he could no longer stand living in Hollywood and took off on a cross-country drive from Los Angeles to New York City. His final destination was to be Great Britain where he’d live as an expat for the next 30 years. In 1960 he published Going Away, part memoir / part road-trip story written about that epic drive wherein he observed the decline and fall of the U.S. left, failing race relations, and general rush of Eisenhower’s America to the right. Going Away has been described as “On the Road as written by someone with a brain.” I think Going Away is the perfect coda to Strange Victory. It and answers in 1956 the questions Hurwitz asked in his 1948 movie.